Fractal Art Without a Computer? Could this work be described as …Fractal? The artist pushed the physical limits of the medium to display details as small as possible. You generally do not expect sculptures to have submilimetric features, Kuksi’s sculptures do. The details have as much artistic importance as the global structure of the work. On his deviantart page, Kuksi displays several photographs of each work, to exhibit details invisible on the global view. Self-similarity is present, through characters and objects of various sizes. Sam’s posting is cautious and doesn’t make broad speculative statements like I do. He says “I think these three pragmatic criterions give a starting point to determine the fractal character of a work.” Note the word, “pragmatic”. It means practical, hands-on, useful for getting something done. Sam is talking about determining the “fractal character of a work” by looking at it and not by the way it was made. That’s an obvious conclusion, isn’t it? 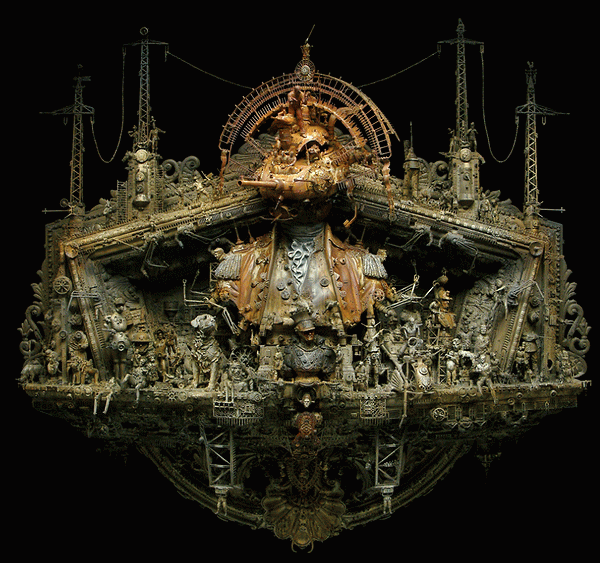 Kris Kuksi’s work only looks fractal; it’s a hand-made sculpture, it wasn’t made with a fractal program. He also says it’s a “starting point”. Even so, I think I can see the finish line from here. This is something very new and very dangerous. I see it as something like the Copernican Revolution for Fractal Art. Copernicus showed that the Earth revolved around the Sun and not the other way around. Until his time people intuitively assumed that the rising and setting Sun was moving around the Earth –rising and setting. Copernicus changed their minds (not everyone right away, mind you) by showing them evidence that the Sun’s apparent movement was actually the result of the Earth’s actual movement. He presented people with evidence that convinced them to see their world in a different context: a Sun-centered context instead of the old Earth-centered context. I think this could be the beginning in what could become the complete unraveling of fractal art as a genre. After this we will all see fractal art from a Visual Context instead of a Software Context. We will see that Fractal Art revolves around visual appearance and not around the software that made it. Fractal Art will be defined by visual criteria and not by its association (whether it’s noticeable or not) with fractal software. If a piece of art can have fractal characteristics derived from something other than a fractal formula, then there’s really no difference between an image made in a fractal program and one made in a plain old graphics program as long as they both have a similar, fractal style. Furthermore, fractal art is then really nothing more than this fractal style which is, of course, easiest to produce with a fractal program but could also include any kind of image resembling the output of such fractal programs. Fractal art is a fractal look and doesn’t have to be something rendered from computing a fractal algorithm. There can be examples of fractal imagery made in a non-fractal program and similarly, examples of non-fractal imagery made in a fractal program. In fact, Samuel Monnier’s pattern piling (see his Portfolio on Algorithmic Worlds) is an example of why we should adopt this more visual definition of fractal art than hold onto the traditional, software definition, because his artwork is, in my opinion, as fractal as any two-dimensional image will ever be and (visually) indistinguishable. In fact, if you don’t adopt the visual definition of fractal art then I guess you have to exclude the kind of work that Sam is making. Even though it is made with Ultra Fractal, it’s not really the usual Ultra Fractal fractal output. Sam has used Ultra Fractal’s programing features to create work that uses non-fractal algorithms and is therefore, by the usual criteria, non-fractal –unless one makes that decision on the basis of visual criteria. Just for illustration purposes, a quick glance over the winners of either years of the Benoit Mandelbrot Fractal Art Contests will show you how overly simplistic and possibly meaningless is the term, fractal art in its current form. What do these images, all chosen as winners in a fractal art contest have in common? and how easily would one distinguish them from artwork in other abstract, algorithmic, or simply digital (eg. made in Photoshop) categories? The rendering methods that are used to produce “fractal” images contribute enormously to the final result and artists can easily start to focus on aspects of an image that are largely created by the rendering algorithm and not the fractal formula without realizing it, and thereby create work which is better called “render-ism” than fractal. Add layering to the process and the ultimate result can be something quite interesting, but also quite non-fractal. Fractal formulas produce a style of imagery, but that style is not exclusive to fractal software. But if we are to include as fractal art, images that portray the fractal style but lack a traditional fractal “pedigree”, then shouldn’t we also question the presence of fractal art images that have a genuine fractal “pedigree” but lack that clearly defined fractal style and even perhaps exclude them? Will fractal art survive such a revision, including it’s neighbors as part of the family because they look like them and abandoning some of it’s own children because they, by the same criteria, don’t look like them? That’s why I think it’s not such a crazy thing to say that fractal art, as a strict and simple category, doesn’t really exist, and probably will become much less distinct in the future, if in fact it doesn’t simply merge with algorithmic art or with the larger, and more general, digital art category. It could happen because fractal artists will see themselves and their work in more general terms and not identify or associate as strongly with the label fractal art as they will digital art or algorithmic art. And why will they see themselves that way? Because they’ll look at their artwork from a different perspective and describe it in visual terms like “I make abstract, decorative type work with multiple layers using things like fractals, masking and other graphical effects”. I think that currently describes ninety-percent of all fractal artists. They’ve been revolving around a specific artistic style for centuries (I mean, years) and not around fractals or anything unique to the software they’ve been using. But like the Earth-centered people in Copernicus’ time, it makes sense to them, it seems natural to them to think that way. They see the Sun revolving around them and not vice versa. But a closer look at fractal art –and fractal-like art– I think reveals those beliefs to be superficial and merely a matter of habit and convention. I think that’s what Samuel Monnier in his observation of Kris Kuksi’s work has discovered, although he hasn’t come (jumped?) to the same conclusions as I have. If we judge fractal art by it’s visual characteristics, then the genre will be extended to include work previously considered non-fractal because of the non-fractal process by which it was made; but the genre will also shrink to exclude works which were previously considered 100% fractal by virtue of the “fractal” software used to create it –because it doesn’t display any fractal characteristics.